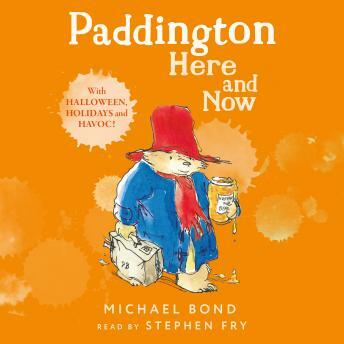 Paddington - the beloved, classic bear from Darkest Peru - is back in this fantastically funny, brand new novel from master storyteller Michael Bond! READ BY STEPHEN FRY!! Paddington Bear always manages to find himself in tricky situations, sometimes extraordinary situations. Like the time he had a difficult encounter with a policeman or when he found himself in deep water with a newspaper reporter. But since arriving from his native Peru after an earthquake Paddington has always felt at home with the Brown family who found him on Paddington station. Then one day, a surprise visitor arrives at thirty-two Windsor Gardens. Is it time for Paddington to decide where 'home' really is? In 2008 Michael Bond's first novel featuring the adventures of Paddington Bear will celebrate its fiftieth anniversary. Paddington's amazing ability to get into and out of trouble is at the heart of the countless stories that have been loved the world over ever since. However, it is many years since a new novel has been published, and in celebration of this landmark, Michael Bond has written the funniest and the most moving Paddington novel ever.